Attribute Views in SAP HANA Modeling are created on the top of Dimension tables. They are used to join Dimension tables or other Attribute Views. You can also copy a new Attribute View from already existing Attribute Views inside other Packages but that doesn’t let you change the View Attributes. Attribute Views in HANA are used to join Dimension tables or other Attribute Views. Attribute Views are used in Analytical and Calculation Views for analysis to pass master data. They are similar to Characteristics in BM and contain master data. 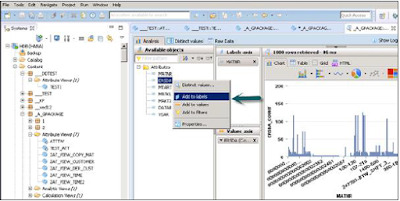 Attribute Views are used for performance optimization in large size Dimension tables, you can limit the number of attributes in an Attribute View which are further used for Reporting and analysis purpose. Attribute Views are used to model master data to give some context. How to Create an Attribute View? When you click on Attribute View, New Window will open. Enter Attribute View name and description. From the drop down list, choose View Type and sub type. In sub type, there are three types of Attribute views − Standard, Time, and Derived. Scenario pane that has Data Foundation and Semantic Layer. Details Pane shows attribute of all tables added to Data Foundation and joining between them. Output pane where we can add attributes from Detail pane to filter in the report. You can add Objects to Data Foundation, by clicking on ‘+’ sign written next to Data Foundation. You can add multiple Dimension tables and Attribute Views in the Scenario Pane and join them using a Primary Key. When you click on Add Object in Data Foundation, you will get a search bar from where you can add Dimension tables and Attribute views to Scenario Pane. Once Tables or Attribute Views are added to Data Foundation, they can be joined using a Primary Key in Details Pane as shown below. Once joining is done, choose multiple attributes in details pane, right click and Add to Output. All columns will be added to Output pane. Now Click on Activate option and you will get a confirmation message in job log. Now you can right click on the Attribute View and go for Data Preview. Note − When a View is not activated, it has diamond mark on it. However, once you activate it, that diamond disappears that confirms that View has been activated successfully. Once you click on Data Preview, it will show all the attributes that has been added to Output pane under Available Objects.